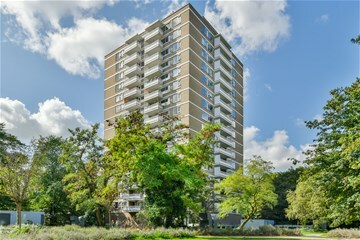 Nachtwachtlaan 127 AMSTERDAM West - Ramon Mossel Makelaardij o.g. B.V. 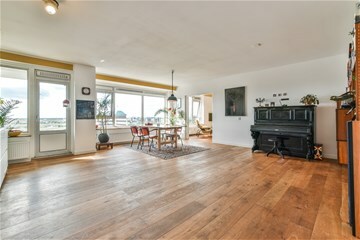 Fully renovated 5-room penthouse of 125 square meters, finished to a high specification and situated on the 16th floor. This specific apartment is the biggest type of apartment in the building and on the highest floor, on the sunny south/west corner. It does not get any better than this. The 16th floor is skyscraper level for Amsterdam standards. 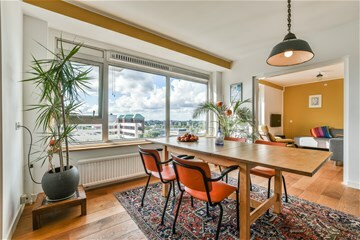 From this corner penthouse you have stunning views of Rembrandtpark, the Amsterdam city and Zuidas business district up to Schiphol Airport and beyond. The exceptional width of the apartment of 14 meters by 9 meters in depth results in great size rooms through. The list price includes a parking space, two spacious storages and a south-facing balcony. Land lease has been paid until 2094. General entrance and lift to the 16th (top) floor. Square size hallway with multiple wardrobe and laundry. All rooms are off the hallway. 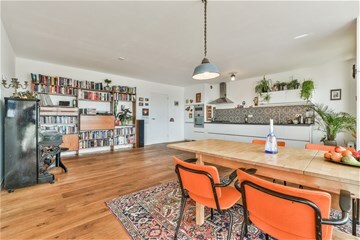 The open-plan living room/kitchen offers access to the sunny, south-facing balcony. The luxurious open kitchen includes all mod cons. 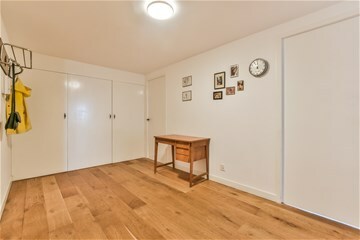 The side room, which is currently being used as a sitting room, can alternatively be used as an extra bedroom since there is enough room in the living room itself (where the dining table is). The other three bedrooms are all off the hallway and of very useable sizes. The modern bathroom comprises a walk-in shower, wash basin and a bath, there is a separate toilet with wash basin. In the entrance hall on the 16th floor you have a separate storage room at your disposal. The second large storage space is at the lower floors, where the private parking can be found as well. 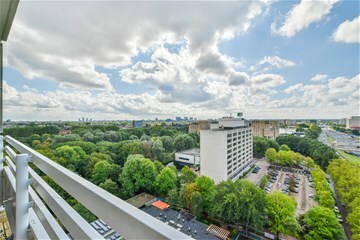 The building is located in Rembrandtpark. 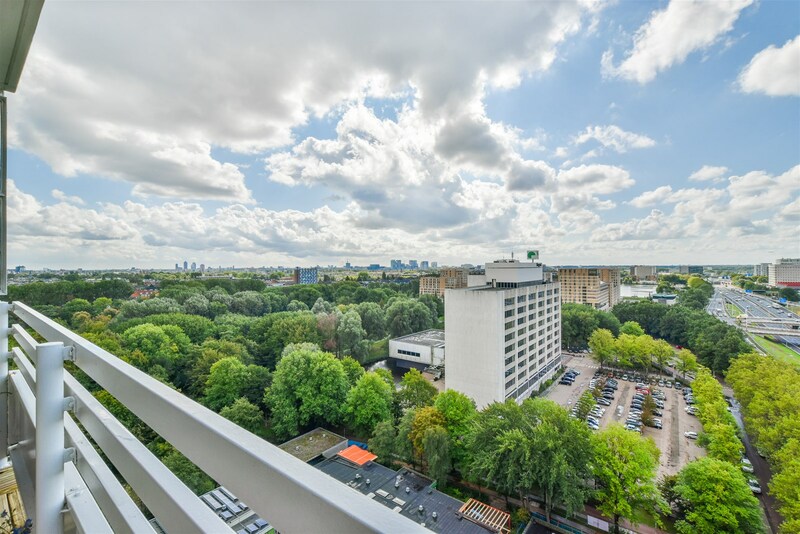 The location is an enjoyable combination of peace and quiet, space, greenery and privacy, but is also within a short distance of the main office locations (including the Zuidas business district), Schiphol Airport, various hospitals, Rembrandtpark and Vondelpark. In addition, Lelylaan Station is just around the corner for train and metro connections, but bus and tram stops are also nearby. You cycle to the inner-city in around ten minutes and by car the Highway A10 is around the corner. Very practical: there is an elementary school with good daycare facilities just next to the building. - Monthly advance for heating € 96,--. This information has been compiled with due care and attention by our office. 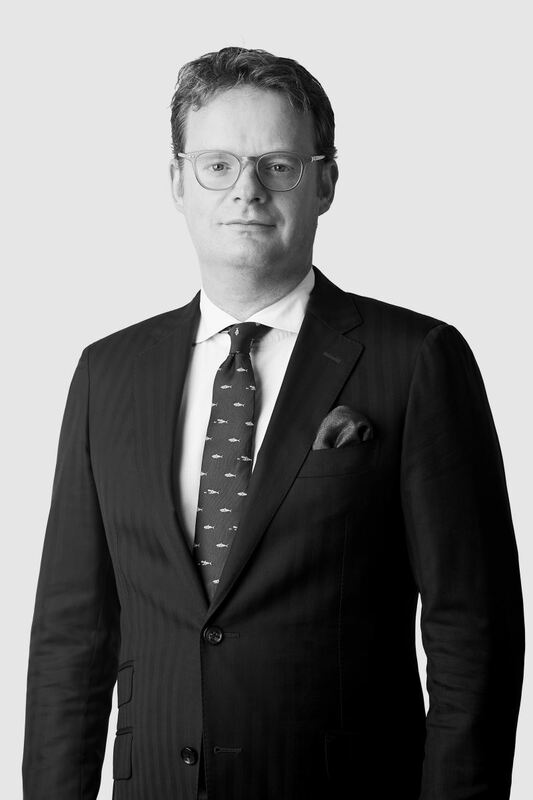 However, we cannot accept liability for any omissions or inaccuracies, or the consequences thereof. All sizes and dimensions are indicative. The buyer remains responsible for verifying all matters that are of importance to him/her. Our office is the real estate agency for the vendor of this property. We advise you to approach an NVM/MVA real estate agent to assist you with their expertise during purchasing. If you choose not to make use of professional guidance, this is deemed to mean that you consider your legal expertise sufficient to handle all associated matters. The General Conditions for Consumers of the NVM are applicable.